In today’s pulp and paper-making market place, consistency measurement is one of the most important ways to keep costs as low as possible without sacrificing quality or production throughput. KPM’s KC/5 rotary consistency transmitter is one of the most advanced units in the market. With its revolutionary direct-drive servo motor KC/5 is a rotary transmitter that delivers excellent consistency measurement performance, lightweight design, simple installation and dramatically reduced maintenance requirements. Thanks to the transmitter’s built-in gate valve assembly, it can be installed and removed while the process is running without having to shut down or drain the line. Through state-of-the-art torque measurement technology, the KC/5 provides quick and accurate consistency measurement applicable to all consistencies between 1,5–16%. Installation cost is low, since it is easily completed, compared to traditional transmitters. It does not need a 3-phase power supply and neither a contactor nor a motor starter is required in the electric room. Only single-phase standard AC power supply is needed and automatic maintenance includes powerful self-diagnostics, friction measurement, and reverse rotation to check zero point and automatically loosen foreign objects. KC/5 is field repairable with no training or special tools required. With no drive belt to change, KPM’s direct-drive servo motor is maintenance-free. No regular maintenance is required due to its unique mechanical seal system. 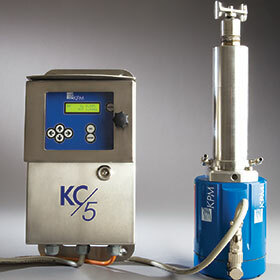 KC/5 is easy to use and operate and start-up can be done by mill’s instrument personnel. Start-up and service training is quoted as an option.